Jonny Quest was a television series that aired in the mid-sixties and has resurfaced on numerous cartoon/kids networks over the years. It was my favorite cartoon growing up and still is to this day. I can’t tell you how many times I have watched each episode over the years but what I can tell you is the number isn’t stagnate. The cartoon follows the scientific adventures of Dr. Benton Quest, his son Jonny, their bodyguard Race Bannon, an Indian orphan named Hadji, and their bulldog Bandit. Of course like any good adventure show there is an evil nemesis. For Dr. Quest it is the very evil yet entertaining Dr. Zin. My first memory of watching this show was shortly after my parents divorced and I was very sick. 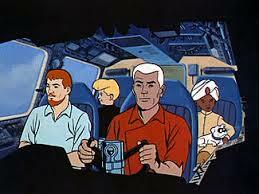 I had been sleeping in a leather recliner, waking up to Jonny Quest on the television. My sleeping on this chair was monumental in itself because I had never been allowed on it. New family dynamics, new rules, or lack of I should say, and the chair became my spot for watching television. I watched many episodes of Jonny Quest in that chair. Episodes that took me to the Sargasso Sea to see a laser for the first time, or to Egypt to witness an artifact being stolen by tomb raiders (“The Curse of Anubis”), or to the Amazon jungle to get a glimpse of indigenous people, illegal mining, and a Pteranodon. I learned what nerve gas was on an adventure to India, went on an archeological expedition in the Yucatan jungle, searched for pharmaceutical plants in Thailand, and found a Nazi war criminal in the Andes. I visited China, Japan, Norway, and Africa. I even found Bigfoot’s cousin, the Yeti, in Nepal, all while never leaving my new chair. Flash forward a few years. I’m a new father and shopping at Wal-Mart looking for kid movies having tired of watching Bambi and The Fox and the Hound too many times. To my surprise I found the complete Jonny Quest season on DVD and had to buy it. My son was around two years old at the time and my wife had started working part time in the evenings so we would not have to put him in daycare. I always had problems getting him to go to sleep so what I started doing was putting on Jonny Quest DVD’s at night and we would watch as many episodes that we could before falling asleep together in my bed. When my wife would get home from work, she would come into the bedroom and gently lift him without waking either of us and take him to his room. This was our routine four nights a week. He loved Jonny Quest as much as I did and at a much earlier age. But did he really understand any of it or was I just using it as a tool to get him to sleep? At the time, we lived in the Phoenix area and a new exhibit was coming to the museum. 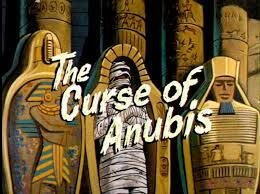 I want to say it was called the Perils of Egypt or Mummies of Egypt. We took him to this after deciding he would be alright to see most of it and if there was anything we deemed too frightening, we would bypass it. We walked into a room filled with Egyptian artifacts on display, and to everyone’s amazement, my two year old son’s eyes lit up as he pulled his binky out of his mouth, pointed his finger at a statue and yelled “Anubis.” He calmly put his binky back in his mouth with his eyes still glued to the statue. Yeah, he understood. I repeated the same process with my youngest son who came along years later. He got it too. A cartoon from the sixties that was way ahead of its time taught me to explore and learn. It has also done the same for my two sons. Sure, there have been other influences in other shows and books but it was Jonny Quest who took the three of us beyond our immediate world, fueling that desire to learn more about other subjects and places. For example, I wrote a paper in college on Egyptian Mythology. My oldest son did the same thing in High School. Inspired by an episode of a cartoon? No doubt about it and I have no doubt my youngest will do the same. I was reminded recently about song association and how a particular song can evoke a memory or a specific time in our lives. The song becomes somewhat bonded with that particular event or memory. This cartoon does that for me as well. It takes me to my own childhood and a dramatic time in my life to something beautiful with my own kids many years later. This same cartoon today is our “go to” show to watch when we are sick, or just want to have an episode marathon… crowded together on my bed just like we did when they were two and three years old. Three distinctive memories we get to relive every now and then when the mood suits us. Will this cartoon affect my writing? Everything affects my writing and this cartoon will be no different. For now, I pay tribute by naming one of my characters after Jonny’s bodyguard, at least in surname. Adventure, travels, and thirst for knowledge? Oh yes. I absolutely loved reading this. Such a timeless tradition you have created. I don’t remember watching that many as a child, my younger siblings usually got to pick so I had to suffer through countless days watching the same movies over and over again (Howard the Duck, Who framed Roger Rabbit to name a couple). My favorite movies were (and still are) Indiana Jones, for much the same reasons you love Johnny Quest. And Robin Hood Prince of Thieves, I think I mentioned to you before how I used to know the whole script and talked along with it 🙂 The timeless programme in our house is The Snowman – every Christmas myself and my girls sit down to watch it, as many times as it’s on! I think it is wonderful that your boys not only loved the show but gained real knowledge from it too. It must have been a heart swelling moment when your little guy pointed to the statue and said ‘Anubis’. Another wonderful post Bill, thank you for sharing. I loved the show and the knowledge gained was really more interest in other cultures and places. I was just chatting with Erin who pointed out the cultural flaws in the show but you have to look at the time the show was produced. Watching it so many years later, there are parts that are stereotypical and just so wrong in today’s world but conceptually the show is still great. As a parent, I still cringe at many of the things Jonny was allowed to do as a child. One interesting aspect of the show were the things I came into contact with later in life such as making parts for a jet with a vertical takeoff or working with lasers for calibrating machine tools. 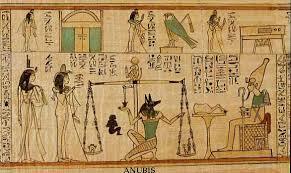 Even the Anubis factor peaking my interest in Egyptian mythology so many years later. Thanks Susan. Just catching up on replies here as I’ve been in Texas all week. It was a great cartoon although a bit dated now culturally. Wow! 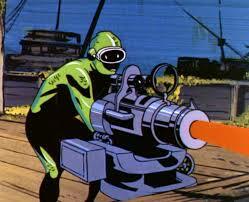 Another Jonny Quest fan. What a small world. The most frightening thing I ever saw when I was that age (I was born in ’59) was the electric monster. Remember that? A shimmering, shrieking, one-eyed monstrosity that had to be shocked out of existence with reverse polarization or some such thing. I had nightmares about it! But I loved the show, too, and watched it every week. I had no idea it was now available on DVDs. I’m going to have to look up a set for myself. Thanks for the post and the memories! I know that episode very well. That was the only one I ever considered scary. The entire season is available. The Jonny Quest episodes that followed years later were not very good and you can see the Japanese influence in the animation and the writing was not as good as the original. I never got into those. I remember watching Jonny Quest when I was a kid. His adventures always amazed me and I couldn’t wait until the next episode. It’s an amazing thing to share that awe with our children. I was just happy my kids enjoyed it as much as I did considering all the goofy cartoons that have come out since. Thanks for reading! This is a great post Bill and I wish I’d seen Jonny Quest – has it been on in the UK? I’m sure if it had been I’d have watched, and loved, it. Sharing something like that with your children is terrific and even now in our house there are films where if I hum a tune from them my (grown up) children will say…’Oh I fancy watching….’ and there we’ll be for the next couple of hours reliving memories and feelings from years before.